Home » News » LVAD-What is it? We have numerous patients with an LVAD (Left Ventricular Assist Device) that live in our city/region. More and more patients are receiving one as a bridge to transplant or destination therapy. As you can imagine, the bridge is temporary until they can get a heart transplant. For those that are not transplant candidates, the best option may be an LVAD. Occasionally, the LVAD can be removed in the future after recovery, but this is very rare. LVAD’s allow the patient to live a full life outside of the hospital. They drive, travel, fly, go to the beach, out to dinner and often have more energy than they did for years prior. The brief explanation below is from the www.mylvad.com website. The website has information on all pumps including an EMS guide and is a great resource. There is a video webinar as well. Please check it out! An LVAD is a surgically implanted mechanical pump that is attached to the heart. 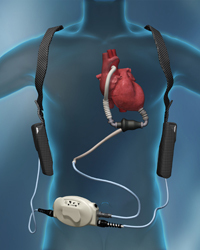 An LVAD is different from an artificial heart. An artificial heart replaces the failing heart completely whereas an LVAD works with the heart to help it pump more blood with less work. It does this by continuously taking blood from the left ventricle and moving it to the aorta, which then delivers oxygen-rich blood throughout the body. The driveline must be connected to the controller, and the controller must be connected to power at all times to keep the pump working properly. The pump is powered by batteries or electricity. Some LVADs have an adaptor that also allows them to run off the car battery. Sentara Norfolk General is the destination of choice for LVAD patients. Contact SNGH medical control for even more information. The patient and primary caregiver are experts on the device. The patient should have a “go bag” with extra supplies and emergency numbers. The LVAD may not create a palpable pulse, automated BP or pulse ox-even when working properly. Auscultate “heart sounds” and if you hear a whirring noise in a continuous flow device, it is working. Previous Article Previous Article: Quiet Please! Be Mindful of Patients, What You Say and Where You Say It.